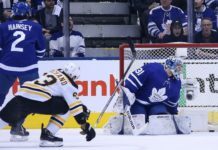 Maple Leafs Hot Stove’s Anthony Petrielli joined Sportsnet Tonight on Sportsnet 590 to discuss the Bruins vs. Leafs series and the Garret Sparks situation. I think by no choice we will see everyone get a piece of it just because the series is going to start in Boston and he’s only going to have so much control. He has no choice. We are going to see them play against the Matthews line. I’m sure they’ll be happy to test that. From Boston’s end, I think obviously they’ll take the Bergeron line against the Matthews line any day of the week, but then I think they’ll probably sit there and think to themselves, “Can the Krejci line or the Coyle line handle the Tavares line?” It is going to go a bit of both ways. It is not like the Leafs are an easy team to match up against. From the Leafs perspective, they are basically going to see how Boston plays those matchups and then it’s more of a discussion for when the series goes back to Toronto for Games 3 and 4. As much as I think Kadri can do it, the problem is the Boston top line is going to play — and we saw this last year if you look at their stat lines — like 21, 22, 23 minutes a night. If you put Kadri in that matchup, it means Tavares or Matthews — and it would most likely be the Matthews line, let’s be honest — would be playing like an average third line. That’s just not going to happen. I think they probably have to do the Tavares line to start as much as they can. If anything, the biggest question is what they do on defense. Everything I’m hearing right now is Bruins in five, and it’s not like Boston cleaned the Leafs out last year. The series went seven. The Leafs went into the third period of Game 7 with a lead. To some degree, they are not going to back down. Forget the Tavares, van Riemsdyk, Bozak thing and all of those players trading in and out of spots — Kadri got suspended for half the series. What a significant player he was on the team last year. I think he is probably the biggest question mark; he sat against Tampa and he really hasn’t looked good this year, to be honest. He is having a significant down year compared to what he has been doing recently. He is probably one of their most physical players. Zach Hyman we know is always physical and grinding things out. We’ve seen Kasperi Kapanen do it. We saw a recent game against the Islanders where the Leafs spent a lot of time in the offensive zone in a more grindy, cycle-y, playoff-type hockey game. But I wouldn’t suddenly imagine that William Nylander is going to start playing physical by any stretch of the imagination. I wouldn’t expect Jake Gardiner to be physical. But hopefully guys like Jake Muzzin can elevate the team a little and maybe some of the depth guys. As much as we talk about the Leafs’ depth, though, I’m not really sure how great it is compared to Boston’s in terms of the flow of play. It is huge. I think it is going to be a large part of the series. I watch Jake Gardiner and think the same things everybody else does at points, but one of his biggest faults but also strengths at the same time is that he is looking to make plays with the puck. It can go really poorly at times and it looks really bad when it does because he holds onto it too long or tries to make a pass he shouldn’t. He doesn’t have that button that says, “There is no play and I just need to get it out or something.” But he is one of the only guys on that backend that looks to move the puck up with a tape-to-tape pass to a guy that is actually open and possibly even moving his feet. Travis Dermott, same thing. I think it is really unfortunate what happened with the injuries and the timing because they never got to explore the defense as a full unit. It would’ve been nice to see a longer run with Muzzin and Rielly. It would’ve been nice to see that Hainsey-Dermott pair and if they could’ve settled in because I think they looked really good together. I kind of liked the look of that overall defense, but now Hainsey is back with Rielly and it looks like they are going to get the Bergeron matchup and I don’t know if anyone can feel great about that. Let’s be honest. This started roughly a month ago when he had the comment that the team was basically lacking emotion. Basically, there was an implication of not really working that hard. I don’t think anyone saw the comments when he said that and said he is wrong. We honestly probably all read it and went, “Yeah, I see that at times. There is a general lack of emotion from the team.” But he is a backup goalie, and he hasn’t done a thing in this league ever. You can’t be saying that. It’s not your role. Your role is you go in for the 15 or 20 games you go in and you keep quiet and you stay out of trouble. I think his comments and obviously his play as well… There needs to be some separation there and some time away from each other, which hey, it happens. But he did himself no favours when he was speaking. And what a message that is by management and the coaching staff. We know how much going on long AHL playoff runs means to them and for whatever reason, they were upset enough they said that they were going to pull their number one starting goalie for the Marlies, who just clinched the playoffs, and we are going to call him up to back up and sit on the bench during our playoff run instead because we’ve just had enough with him. Up until a few days ago, I was thinking they were just going to run with him next year at the very least to start because he is cheap and it just seems like they’ve made up their mind that they like him as a sort-of-young [option], although he’s not really that young at this point. And then yesterday happened and I don’t know how they don’t at least give him competition, whether that is Hutchinson or somebody else, and have him at least come into training camp and earn it and have a good attitude and don’t say anything that is going to get him into trouble with the media or his teammates or whatever the case is. I would be floored if they handed him the keys to the backup position again next year. I can’t imagine Babcock would be on board with that.